When you use a finger lap counter, you will be able to track your own laps. As you work on your training for swimming, you will likely find yourself swimming laps in the pool on a regular basis. Your coach may assign you a specific number of laps per day or you may have your own number you strive for. No matter whether you have to swim the specific number of laps or you want to, counting those laps can be a challenge. Knowing how fast you completed those laps is another challenge, especially if you are working on your own. The SportCount Original Lap Counter and Timer can help. As you swim back and forth across the pool, you need to be able to think about your technique instead of keeping track of how many laps you have done. The ability to keep track while still keeping your focus on swimming is difficult, if not impossible, for most people. When you have a lap counter that fits conveniently on your finger, you will be able to easily hit the lap counter every time you turn. When you climb out of the pool, you will have an accurate count of how many times you went back and forth across the pool. You can track up to 9,999 laps. Having a finger lap counter can provide you with more advantages than just counting laps. Each time you hit the button on the lap counter, it will record the time it took you to complete that lap. Not only will it give you an average lap time for all the laps you completed, it can also provide you with your fastest and slowest times so you can see how much you have improved or how much work you still need. It can also tell you how long you spent in the pool total. Being able to count your laps accurately, as well as keep track of your times, can be an excellent asset to swimmers who are looking to improve their speed. However, unless you have someone who can take the time to work with you and keep track of your laps and times, you won’t have an easy time doing it. That is unless you use a finger lap counter. 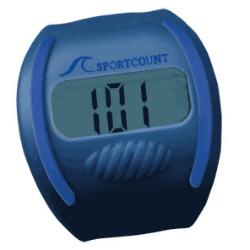 The finger lap counter by SportCount is water resistant up to 50 meters, making it a great asset for swimmers who will spend all their time at the water’s surface.